Margaret is the only prograde non-spherical moon of Uranus. It was found by Scott S. Sheppard, et al. in 2003 and given the designation S/2003 U 3. Margaret stands out as the only prograde non-spherical moon of Uranus. 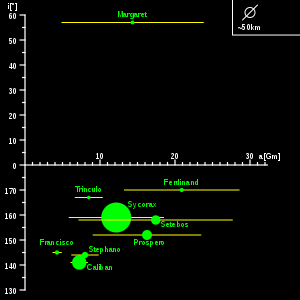 The diagram illustrates the orbital parameters of Margaret, unique among the non-spherical moons of Uranus, with inclination on the vertical axis and the eccentricity of the orbits represented by the segments extending from the pericentre to the apocentre.